If you're looking for purpose built student accommodation in Ormskirk, The Ridings is the place for you. 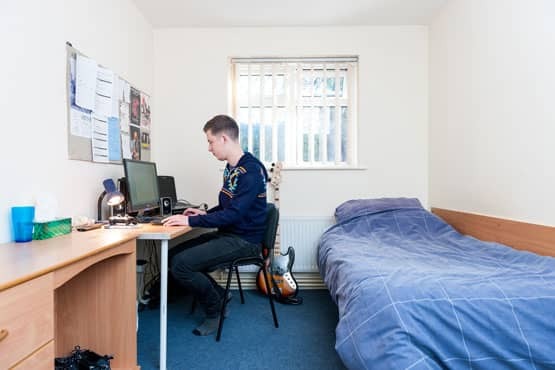 Sanctuary Students accommodation in Ormskirk is just a 10 minute walk from campus, providing a perfect base for students at Edge Hill University. Short term contracts are also available at Grange Court & The Ridings. Contact us to find out more. Perfectly located near to campus. A washing machine and tumble dryer in each flat. 24-hour maintenance support means we’re on-hand to fix a fault at all times of the day and night. Caretaker support means we’re on-hand to help you. Parking is available for your car. Sanctuary Students Ormskirk is located in the centre of the idyllic town of Ormskirk in Lancashire, just a 10 minute walk from Edge Hill University. The Ridings offers purpose-built student accommodation with spacious eight bedroom flats, while Grange Court is an eight bedroom terraced house located on nearby Windmill Avenue. Both locations feature shared kitchens with laundry and bathroom facilities in each flat. Students may be offered a room in either The Ridings or Grange Court. If you live with Sanctuary Students in Ormskirk, you'll benefit from great features including all inclusive bills and free contents insurance, making sure your time with us is hassle free. We also provide a caretaker service and 24 hour maintenance support. Car parking is available for an additional fee of £175 per year. If you're looking to live a little further afield, we do have rooms available in our Preston accommodation. Moor Lane Halls and Walker Street are both a 10 minute walk from Preston train station and you can get a direct train through to Ormskirk. Should you be interested in staying at Preston, please contact the staff at the Preston Office via this website or simply apply online. If you're an Edge Hill student looking to make the most of university life, Sanctuary Students is the perfect place for you. Grange Court and The Ridings is situated in the idyllic market town of Ormskirk in Lancashire. The accommodation is just a 15 minute walk from Edge Hill University, and 5 minutes from a large supermarket. West Lancashire Health Centre is 15 minutes away. 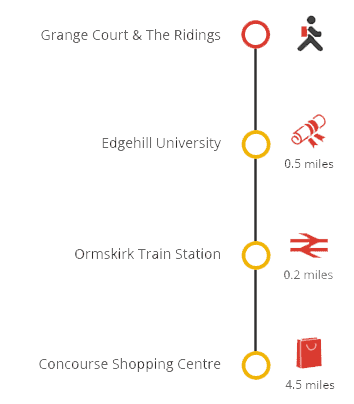 Both the Ormskirk Railway Station and Bus Station are five minutes away. The trains station provides excellent links to Liverpool, Preston and beyond. Ormskirk is home to Coronation Park and Chapel Gallery, and both are just five minutes away from Grange Court. Ormskirk's open air market is held twice every week and boasts over 100 stalls, with locally produced food, crafts, clothing and household goods. The town centre has a full range of high street shops as well as independent retailers. Broadband services are provided by Optify - one of the UK's leading providers of Internet services for student accommodation. Broadband at speeds up to 12Mb symmetric. You will also have the option to upgrade to a 20Mb or 50Mb service. IPTV, delivering a range of TV channels direct to your PC or laptop. When you arrive at either the Ridings or North Western Hall to collect your keys please make sure you remember to bring some photographic ID (either a passport or driving license is fine). Please let us know in advance if you’re going to be arriving outside of our opening times by calling us on 0870 600 4777 so we can make arrangements for your keys to be left with the security guard. It’s important that you do this as otherwise your keys will be securely locked away over night. We only have limited parking facilities and a permit is required to park on the surrounding streets so you’ll need to use local car parks. You’ll be allowed to park outside the building for a limited time only and then you’ll be asked find an alternative place to park.